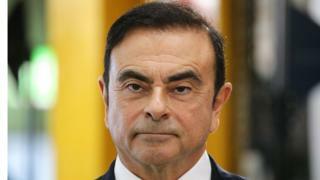 The former boss of Nissan, Carlos Ghosn, has been granted bail by a Tokyo court in a surprise decision. The court set bail at one billion yen (£6.8m; $8.9m) and Japanese media reports said he could be released as early as Wednesday. Mr Ghosn has been charged with financial misconduct but has consistently denied any wrongdoing. The court had rejected two previous requests for bail, saying Mr Ghosn was a flight risk and could hide evidence. On Tuesday Mr Ghosn reiterated his position, saying: "I am extremely grateful for my family and friends who have stood by me throughout this terrible ordeal. "I am innocent and totally committed to vigorously defending myself in a fair trial against these meritless and unsubstantiated accusations." The latest request was filed by a new legal team, which was appointed by the Brazilian-born executive last month. On Monday, the head of his defence, Junichiro Hironaka, said he was optimistic Mr Ghosn would be granted bail. Nicknamed "the Razor", the Japanese lawyer has a reputation for winning tough cases. Prosecutors appealed against the decision but this was later rejected by the court. The 64-year-old has been in custody for more than 100 days since his arrest last November on allegations he understated his income at Nissan. He has also been charged with aggravated breach of trust. Bail is rarely granted in Japan without a confession and the length of Mr Ghosn's detention had drawn some criticism. Ghosn's France-based lawyers on Monday said that they had complained to the United Nations that their client's rights had been violated during his detention in Japan. Bail conditions require Mr Ghosn to stay in Japan and be placed under video surveillance. Following his arrest, Nissan and Mitsubishi removed Mr Ghosn as chairman. Renault initially kept him on as chair, and he resigned from the French carmaker in January. In a statement, Nissan said it was not in a position to comment on the decision to grant Mr Ghosn bail as it "does not have any role in decisions made by courts or prosecutors". "The company's focus is firmly on addressing weaknesses in governance that failed to prevent this misconduct." Mr Ghosn was born in Porto Velho, Brazil, to Lebanese parents. He was once tipped as a potential president of Lebanon, a move he eventually dismissed because he already had "too many jobs".